This room required a careful rethink to make the most of the available space. When we first visited there was a second door leading through to the hallway which restricted the available space for the kitchen. We decided the best course of action was to close off this door giving us the possibility of a clean run of cabinetry from one end of the kitchen to the other. 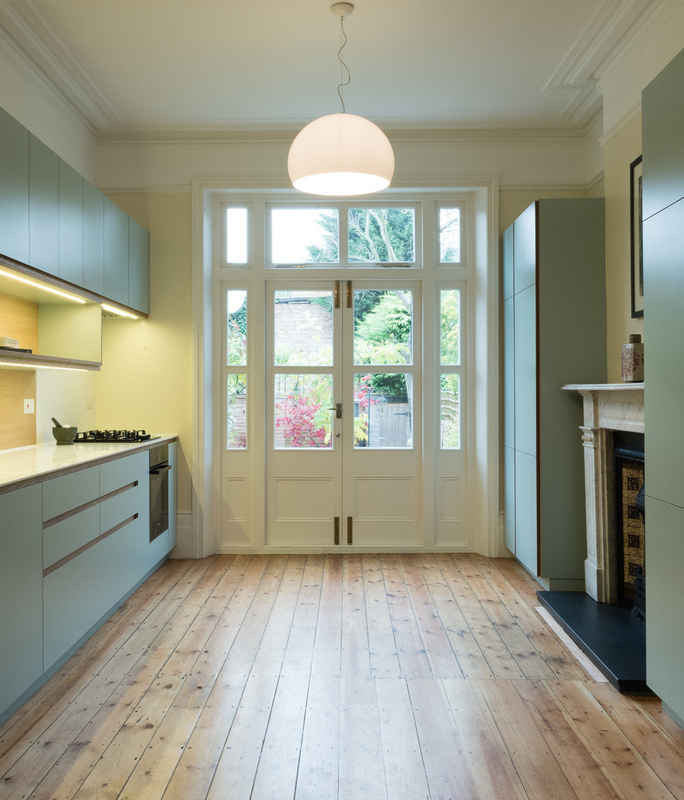 In the hallway we wanted to preserve the original architrave and Victorian panelled door, so we left it in place and a filled the shallow void behind with shelving to provide a space for our clients collection of curios. Opposite this section of cabinetry we installed units either side of the chimney breast incorporating a laundry and cleaning area, an integrated fridge freezer, and full height pull out larder. 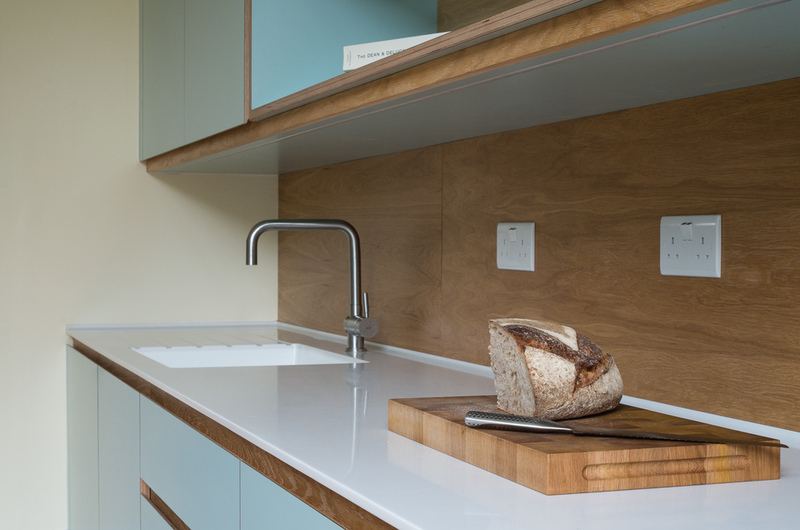 Our client wanted to introduce some colour into the design and chose a duck egg blue HPL decor which we laminated onto birch plywood for the doors and drawer fronts. Recessed oak finger pull backups and detailing allowed a handle-less design. 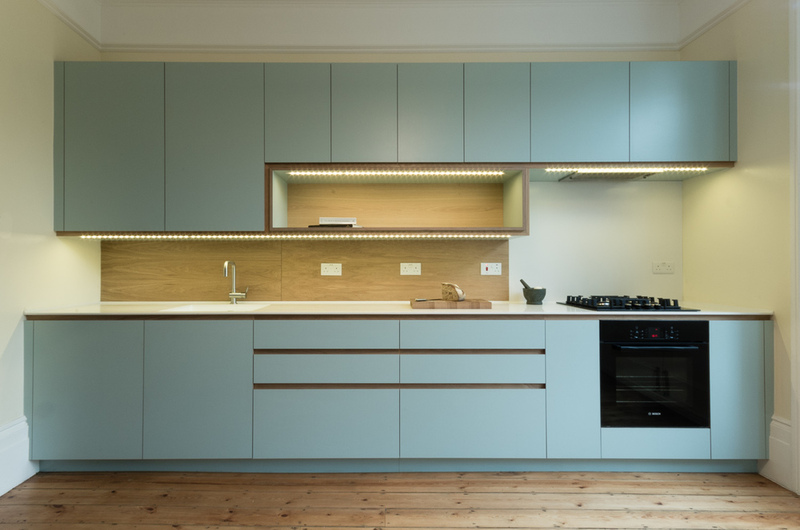 All interior cabinetry in this kitchen was constructed using white melamine faced birch ply, a highly durable and attractive material. 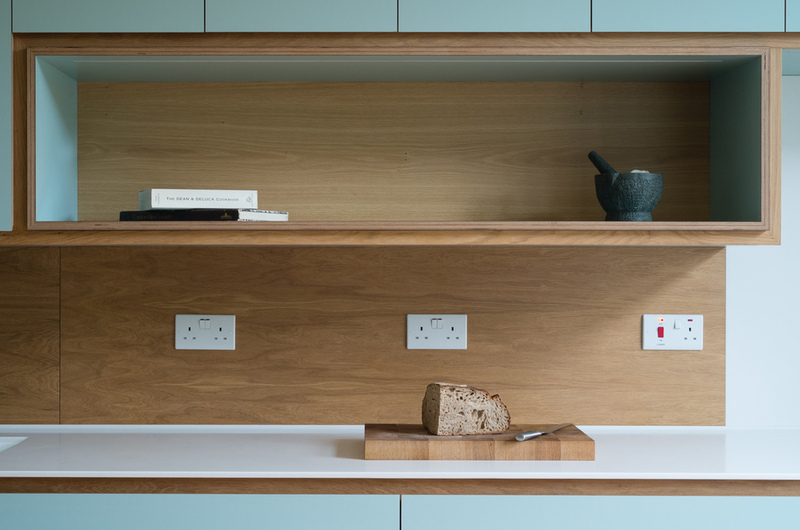 To add texture and interest to the kitchen we chose to create an open area of shelving outlined with solid oak and fitted with integrated LED lighting within the run of wall units for our client to display some of her favourite things. Work surfaces in LG HiMacs complete the picture offering crisp, minimal visual impact whilst being practical and durable.